This piece is my first ever Miss Mustard Seed’s Milk Paint project. Boy did it have an impact. I guess you could call this my signature piece. 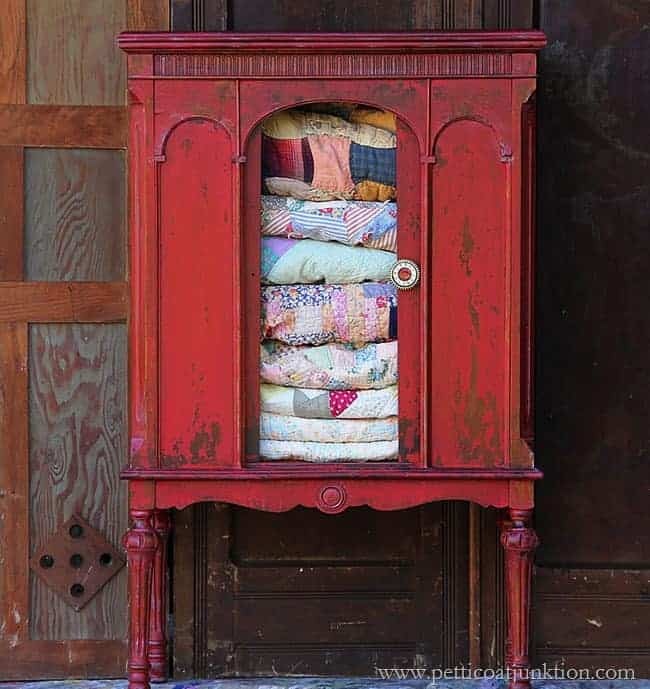 When I went to my first ever Haven Blogger conference….I was know not as Kathy…or Petticoat Junktion…but as “the one who painted the red cabinet”. 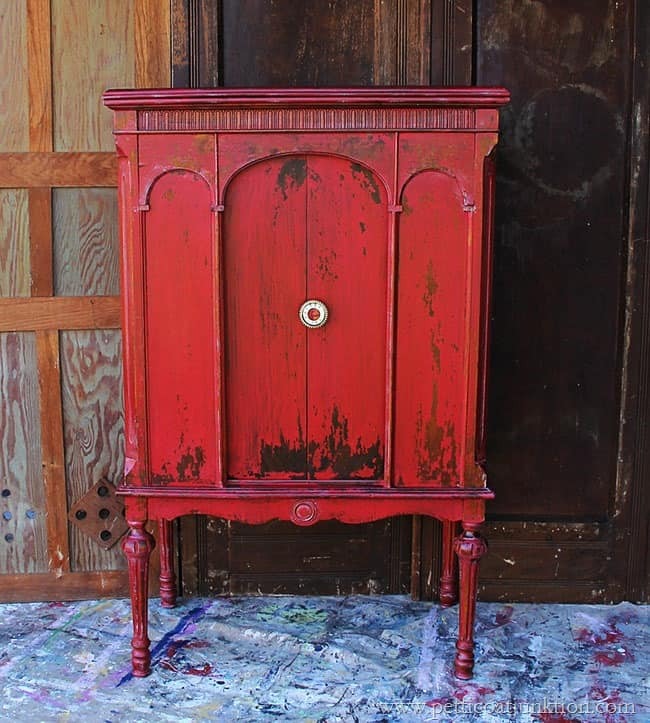 I owned the cabinet for several years before I decided to take the plunge and paint it. I never use furniture polish or anything similar to clean it…just dust it occasionally. The milk paint finish has never peeled or flaked off. I read where some people have problems with the milk paint continuing to flake off after waxing or sealing the paint. I’ve not had this problem on any milk paint finish. I decided over the weekend to share the makeover with you again. I took all those quilts out…..moved the cabinet to the workshop…… rubbed it down with MMS Hemp Oil…and had a photo shoot. The Hemp Oil just an extra layer of protection and is also water resistant. Have you seen the cabinet before? Are you coveting my quilts? You can see the original post and the full tutorial here…. I’m always sharing things on Facebook, Instagram, and Pinterest that don’t show up on the blog. Hi there – it’s my first time visiting your site. I’m in Cornwall, England and I love old & chippy too! This is a great project – so cosy. I’ve just started posting a few of my projects (www.athomeincornwall.co.uk) but I’ve never heard of milk paint before – does it behave like chalk paint? Dawn. Gorgeous! I love the red and the chippiness! Yes to all the above. I love milk paint, I have never used store bought milk paint, but guess I will start, I can’t find my recipe and my secret ingredient, it is so secret I don’t even know what it is. One of my patients in Tallahassee, Fl was about 86 years old and the cutest little lady I think I ever met. One day I went into her room and she was smiling real big and showed me a picture of her granddaughters hope chest, well I had never seen anything like it, the most beautiful chest I had ever seen, she said it was the last thing her husband made before he died and she said it was the last thing she had painted, I wish I had a picture of it, it looked like something right out of the 18th century. This lady and her late husband were from Norway or Sweedan, but anyway I told her I was trying to paint a little chest and I was trying to duplicate that look, but none of the paint I used looked like that, she laughed and said you can’t buy this kind of paint I asked what kind of paint is it and she said milk paint, well I have never heard of it and she gave me her recipe and she asked for my address and said she would mail me the secret ingredient and she said you must use an eye dropper and only one drop per batch, she said she would send me enough to last me a lifetime and true to her word I got it in the mail about a month later and her address in Mich. I guess I lost it when I moved into this house, I’m just sick about it. That paint was so good I kept that chest for years and it didn’t fade or chip or flake. Guess I will try MMS the next time I need milk paint. After seeing this piece on your blog, I just had to tell you how much I loved it. And it was my first time to comment on any piece on any blog…Still LOVE it! Wow!! Thank you Tina. I feel really special. Thanks for the comment and please comment again! Guess that piece was before I found your blog. Loving that cupboard, an old radio cabinet? MMS tricycle red is awesome on that piece. Like it was formulated for it. Love love it. Do you use piece in your home or are you going to sell it? Boy how I’d love to have it. Loved your quilts also. We can’t find some of quilts we used on bed last winter, cannot remember where we put them. Think out in shed. Have a few of heavy Mexican blankets but can’t find them. Usually I don’t care for that much distressing but it seems to go with piece. Awesome girl. I’m going to pin this also. Never used the milk paint but would like to try a sample pkg anyway. Do you know how far a sample pkg of milk paint covers? I’ll have to look into MMS site for her milk paint. Happy week, don’t work too hard. Do you ever get to enjoy life? Yes, love it. I have it pinned and several have added. I have wanted an old radio cabinet since I saw this and how you are using. I have pinned several others which have been redone. Thank for sharing again. thanks for sharing Kathy, this piece as given me a new appreciation for red, and once again, your talent! I hadn’t seen this before, love the red!!!!!! Hi the red cabinet lady, LOL I love tricycle red and I love it on your gorgeous cabinet! It’s been several months since I “played” with Milk Paint but I love the process. I haven’t tried hemp oil and it’s on my shoppping list. Do you prefer it over using clear wax? Is it less labour intensive?